Daily Illuminator: Get Mixed Up With Munchkin Magical Mess! February 13, 2018: Get Mixed Up With Munchkin Magical Mess! Moop is back with more mashed up monsters and weapons, plus all the groan-inducing jokes you need! Probably more than you need, to be honest. 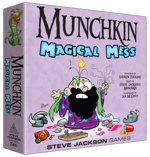 Munchkin Magical Mess is available now, and it's fully compatible with Moop's Monster Mashup for more monsters and much merriment. Munchkin Magical Mess is a deluxe-style game, so apart from the cards featuring terrible jokes and punny illustrations, you'll also get a beautiful gameboard plus player standies to track your level, even if you can't keep track of all the monster mashups you've already seen. It is illustrated by Ian McGinty, who has lent his brand of dynamic art to us before to bring Munchkin Guest Artist Edition and Moop's Monster Mashup to life. There's a whole lot of magical, messed-up mayhem in this core set! You can make mincemeat of monstrous creatures like the Chupacobra with mashed-up weapons like the Butterfly Knife. And because we can't resist mentioning another one, try clobbering the Chimpanzebra with the Shark-Head Hammer! As with any Munchkin game, you kick down the door, fight the (mixed-up) monster, grab the treasure, reach level 10, and win! So if you love weird mixed-up animals, terrible jokes, and backstabbing, this is the Munchkin game for you! Get it at your FLGS or purchase it online through our very own Warehouse 23.